I can highly recommend Angela’s Spanish classes. Great teacher. Makes it fun and not too formal. I knew no Spanish when I started and 14 weeks later I’m surprised at how much I’ve learnt. Small class group sizes allow for individual teaching. The classes are interactive and fun. However the most important part is that the Spanish classes allow you to practice and learn new conversational skills. Angela is an inspirational teacher who is very encouraging. 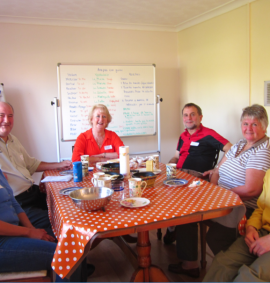 Beyond small-group weekly lessons, there are enrichment events such as conversation evenings and film nights. As always, the best learning happens when you enjoy it. And this is so enjoyable! If you want to learn Spanish then this is a great place to do it. Angela is an excellent teacher and the group dynamics she creates are spot on. Every week is enjoyable and intensive mixing formal learning and games (playing snakes and ladders whilst having to conjugate verbs was so much fun). They say learning a language is an important way of keeping the brain healthy and active. Join Angela and that is guaranteed. I have been attending Angela’s classes for six months. I started with a very basic level of ‘tourist’ Spanish, and am delighted with the progress I have made. The group atmosphere is welcoming and encouraging, and Angela is very clever in the way she encourages learning through participation: by the end of the class you realise that you have used more Spanish and learned more than you would have done in a traditional lesson – and it’s been enjoyable, not least because Angela always seems to enjoy the classes herself! She’s also very kind about responding to emailed questions between lessons.. I have been learning Spanish with Angela for about 4 months now and I always look forward to her classes. She has a good sense of humour and makes the lessons fun and more importantly, I am not afraid to try out my Spanish. Having struggled to teach myself with CDs for about 2 years now, I really feel like I have come on in leaps and bounds since going to Angela’s classes. When I go to Spain I can actually make myself understood and Angela has given me the confidence to have a go at speaking Spanish when I’m over there. I also love our little group as we always have a laugh! 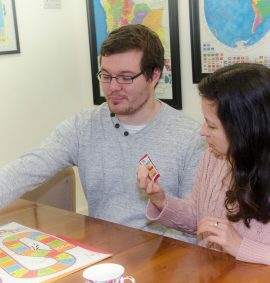 Spanish classes that are tailored to suit our individual needs as a family has made learning Spanish so much easier for all of us this past year. Angela is a brilliant and encouraging tutor. We all enjoy our classes. What a great way to learn Spanish! Small groups .. structured learning and a whole lotta fun along the way. Now in my 3rd year with Angela. It’s great having a native speaker as our teacher and the extra elements ~ Conversation Club and Film nights~ create a wider learning community. It is difficult to speak Spanish well with a grin on your face .. but we manage! Highly recommended. Very friendly, non-judgemental and personalised Spanish language lessons. Small class sizes and high quality teaching. Angela makes learning Spanish interesting and fun. All the classes are small and informal. If you’re thinking of trying to learn Spanish, this is the place to be. The monthly club activities are an excellent bonus as well as helping us improve our understanding. I love the lessons at the Spanish learning club – the teacher Cristina is very enthusiastic and makes the lessons fun! Our Spanish group loves understanding the grammar so as well as going through the book and chatting in Spanish, she is endlessly patient explaining the differences so we can understand. I have recently started one of the Spanish for beginners courses. I have always found learning languages difficult, but the Spanish Learning Club has made me feel that I can do it – at my own speed! The small class size makes the lessons fun and interesting. The teaching is patient and very effective. I recommend the Spanish Learning Club to anybody wanting to study Spanish. Really enjoy my Spanish lessons with Angela. She gives me confidence, is always encouraging and has a very effective management of pace during the lessons, which puts me entirely at ease. The topics she introduces are stimulating and always stretching. Often the lesson time is over before I have had the time to think about it! My husband and I wanted to learn Spanish and, having tried with very little success a few years ago, were delighted to find the Spanish Learning Club very near to us. We really enjoy the lessons with Angela who is unfailingly encouraging and patient and makes every lesson fun. We look forward to the lessons each week and the hour is always over before we realise it. The monthly club activities mean we meet other learners in a relaxing and entertaining environment – and we learn some Spanish! We’ve only just started on our journey to learn Spanish but, with Angela’s help, are sure we’ll succeed this time. Angela provides personalized helpful and fun teaching of Spanish. Now I can chat every day with hoteliers, bar staff, and drivers here in Peru! I am so pleased with my Spanish exam results! Thank you for everything, you have honestly helped me so much. And I am so grateful for everything you have done for me. We have been studying with Angela now for 3 years, and she manages to keep the Spanish lessons interesting and enjoyable. She is always very encouraging of our efforts, and flexible to our needs. I found all that I learnt in my lessons last summer so helpful once I got back to school and since then I have developed such an interest in Colombia. So thank you so much for engaging me in such a fascinating country! Great classes with friendly atmosphere, always willing to help, constantly researching to make the sessions enjoyable and fun, sharing various resources, not to mention native speaker! Angela is very supportive and great at building confidence. Often the Spanish sessions are based around a theme and you learn a lot about Latin American culture. Anyone can teach. What sets Angela apart is an unique quality that she both understand and take an interest in her students. She knows that I am not a good student; don’t do my homework nor study at home. So instead of trying to make me adapt to her curriculum she has adapted my Spanish lessons to address my failings finding different, inventive and fun ways to teach me and keep me interested. Much appreciated. Look forward to many more lessons with her.